Bed Bath & Beyond™ is a retail chain with over 1,000 stores in North America offering one of the largest selections of products for your home anywhere, at everyday low prices. Bed Bath & Beyond’s extensive line of merchandise includes bed linens, bath accessories, window treatments, kitchen linens, cookware, dinnerware, glassware, lifestyle accessories, closet and storage items, and decorative accessories. You’ll always find brand names you know and trust such as Wamsutta®, Cuisinart®, Canadian Living, Philips, Zwilling J.A. Henckels, Breville, Oneida®, Mikasa, and HoMedics. Bed Bath & Beyond Gift Cards may be used at any of our stores nationwide or online and are redeemable for merchandise only. Bed Bath & Beyond Gift Cards do not expire, never have a fee and are replenishable. 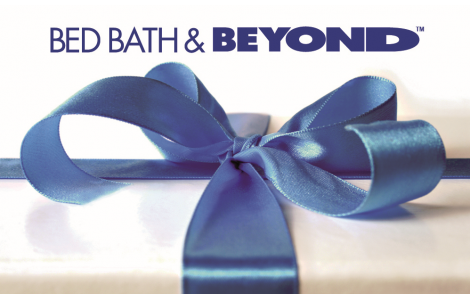 Visit online at www.bedbathandbeyond.ca or call 1-800-GO BEYOND™ (1-800-462-3966) for locations nearest you! This card is redeemable for merchandise only and may not be redeemed for cash, except where required by law. This card is denominated in Canadian dollars. If a card is lost or stolen, a replacement card will be reissued with the balance remaining when an original receipt is presented. Bed Beth & Beyond Inc. and subsidiaries. Good at any Bed Bath & Beyond™ location in Canada, the United States and Puerto Rico or online at www.bedbathbeyond.ca.